Friedrich Johan Justin Bertuch was born in Weimar, where his father was a garrison physician in service to the duke. Orphaned at 15, he lived with his uncle and pursued an education in theology and law. Bertuch was a successful entrepreneur and a true man of the 18th Century Enlightment philosophy, sharing the general preoccupation of the age with the education of the young, as well as the categorization of knowledge. Later in life he became a writer and publisher, and in 1790 he began his major publishing project, the first pictorial encyclopedia for children. It was a 12 volume work and a landmark in educational publishing whose vibrant illustrations are still admired today. Believing that education was a means of social progress and self-improvement, he wanted to make sure that his encyclopedia was not only informative and written at a childs level of understanding, he also felt the emphasis should be illustrations that were beautifully and correctly drawn. 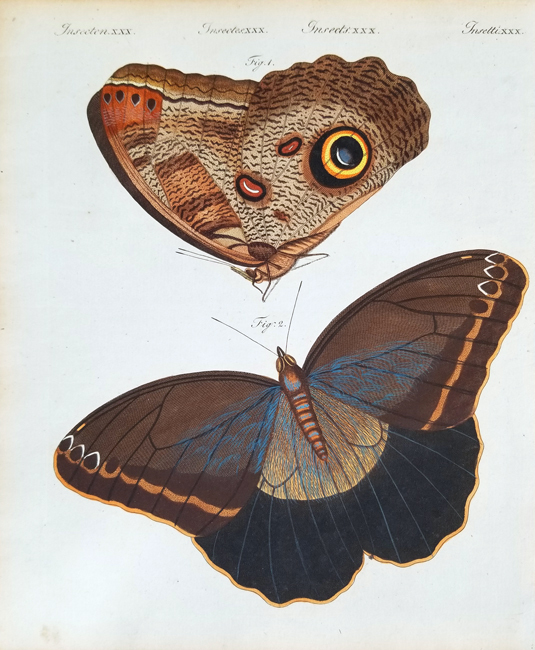 Therefore, the encyclopedia was illustrated throughout with vivid and detailed copper plate engravings that were scientifically accurate and sophisticated in their composition and execution.